I thought that the Ts were trees. Which would have been nice, because Ts do actually look like trees, but it turns out that they represent towns. His solution, and this is almost unbelievable, is to repeat the code that shows the map one hundred and thirty times. Then, using “if my location is 3, 4″ type programming constructs he chooses which one to show. No idea? What, none? You didn’t have even the smallest alarm bell dinging about, say, 50 copy-pastes in to this massive affair? You completed the entire exercise of creating 130 repeats of the same block of code with a minor, predictable difference without thinking “perhaps I could do this with a loop, or something”? You had to ask on an Internet resource with absolutely no clues at all? Did the brain even warm up? Or did sheer laziness prevent any thinking whatsoever? For crying out loud, this is worse than cutting your lawn with nail clippers and then, having finished, observing to your neighbour that it is “amazing that there isn’t a better way of doing this”. It’s wonderful that people are learning to program. It’s a valuable, interesting skill that — in theory — teaches all sorts of problem solving skills but for those to develop, they need to be practiced. This means attempting to figure it out for yourself. When you finally reach a dead end, show your working when asking for help (he was asked “what have you tried?” to which he replied “I’ve not really tried anything yet”, emphasis mine.). It’s OK to ask for help, but the assumption is that you’ve at least made an effort that can be quantified without requiring an electron microscope to find it. As an added bonus, people can advise you on your problem solving and how you might save some time later. It’s win, win and win. You don’t win friends with bone idleness, just as you don’t with salad. Laziness should neither be encouraged nor tolerated: I genuinely hate to appear negative to someone who is ‘learning’ programming, but this is programming by proxy, or, more specifically, programming by piecing together other peoples’ solutions to your problems. A while back, I said I was going to do a C++ tutorial via the medium of writing a 1980s style text adventure game. Needless to say, I completely failed to get around to it. This isn’t from lack of desire, it’s from lack of time (plus only one person was pestering me and not nearly often enough – you know who you are, Montaigne). However, since I’ve had a draft of this hanging around on my hard drive for the best part of nearly a year, I figured it was worth brushing it down, beating it into shape and slapping it onto the blog to make it look like I’m doing regular updates. So many wonderful places to explore, but much more importantly, features an OXBOW LAKE! Yeah for my ‘B’ in O Level Geography! I knew it would come in handy eventually. Eh? Eh? Honestly, I’ll bet you’re gagging to play this game now. Who wouldn’t want to traverse the Marsh of Crocodoom or the Plains of Waiting Disaster? And those Shrubs of Terror are particularly inviting. 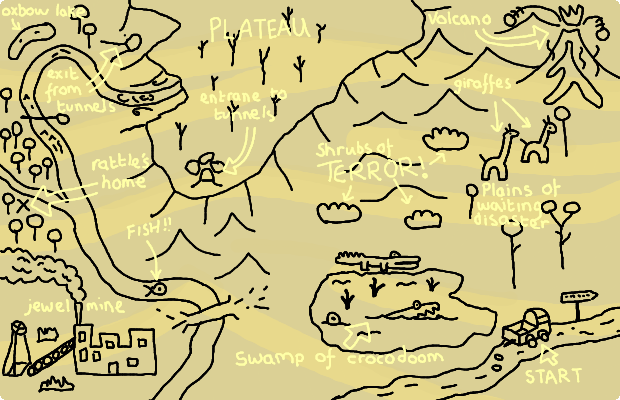 Of course the map features a plateau and a volcano. All good adventure games have volcanoes, because they’re cool and they feature deadly lava. “Enhance the game with improved puzzles and basic graphics to illustrate the various scenes. Allow for the possibility of multi-player where more than one player can take on roles inside the adventure at once. Look towards creating an iOS version so that it can be made available on the Apple App Store”.might take this as the days, months, years and generations roll forwards. If nothing else, it lets us avoid accidental closing of doors by designing for a future regardless of whether we make it there or not. Armed with our plot, the map and the “design” we’re about ready to begin laying down some code, which is a shame, because we’re flat out of time on this episode of “Stringing it out for years”. But next time, next time we’ll code like there is no tomorrow. Bring a toothbrush. And wine. Here’s a “hello world” program to get you going because, well, it wouldn’t be quite fair to have a programming tutorial that had no software in it at all, now, would it? In the meanwhile, if you're planning on following this tutorial (and you'd better be really, really patient to do so) then you might want to get yourself sorted with a C++ compiler and see if you can get the above to compile and run as a command line program. If you can, you're ready to start putting together the adventure of a lifetime, saving Rattles McCoil from doooOOOooOOOoom! Windows users, try Visual Studio Express. Mac users, install Xcode from the App store. Anyhoo, tune in spring 2014 for the next gripping part of this series, perhaps earlier if anyone pesters me about it sufficiently. Oh, and go and watch the Spongebob Squarepants movie. With or without popcorn. 1 It's a fantastic movie. Even if you're not a Spongebob fan (which you should be), it's a really fun watch. 2 This is not true. I have personally worked on major titles that have had no specification at all and two of them were Amiga titles that I was the only programmer on. Sometimes, someone knows the design so well in their head that it “just happens”. On the other hand, other titles have had virtually no design and have ended up a complete catastrophe of misplaced dreams, hopes and ideas. Like porridge, it’s too easy for it to be “too hot” or “too cold”. Just right, on the other hand, is tough. Getting it wrong incurs the wrath of bears, so be careful out there. 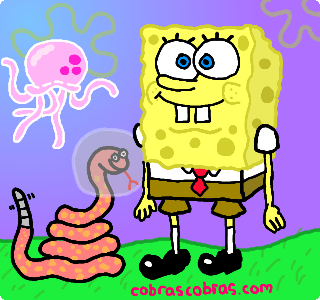 This entry was posted in Software development and tagged adventure game, cobra art, Rattles McCoils, schedules, slow progress, snake, specifications, Spongebob Squarepants. Bookmark the permalink. I followed the link to Visual Studio Express. Is there any way I can use it without it costing me £500+ to purchase? or would I use the Visual C++ 2010 Express programme, which is free to use? You’re absolutely correct — it is Visual C++ 2010 express edition. When you are creating a new project, create a “Command Line” project. I’ve not used the latest express edition so if you need a walk-through, let me know and I’ll get it downloaded. I have the software open and can find how to start a new project but there is no Command Line option for a new project. It might be under “Win32 Console Application”. I’ll see if I can give it a spin myself in the next day and let you know. Edit: This article on MSDN might help? That says “get a character from the user”, which we then dump. It’s a way of keeping the console window that Visual Studio opens *open* so you can see the results. With this extra line before the return (0), you should see a console window open when you press F5 with the words “Hello, giraffe and snake lovers!” in it. Incidentally, I’m not sure why you are getting the linker warnings. Let me know if it runs OK with this extra line and then I might just make a blank project up and put that on the web site so that it is a known start position. I think he may have two main functions. The weird one Microsoft gives you which looks like _tmain and the one above.